Peach Couture® Fold-able Tote Bag Just $9.95! You are here: Home / Great Deals / Amazon Deals / Peach Couture® Fold-able Tote Bag Just $9.95! We have a great deal on a bag for you today! Get the Peach Couture® Fold-able Tote Bag on Amazon for just $9.95 (reg. $29.95). There are five prints to choose from, but I’m really liking the print above – coffee! Super Saver Shipping will be FREE with an order of $35 or more or get FREE 2-day shipping with Amazon Prime. 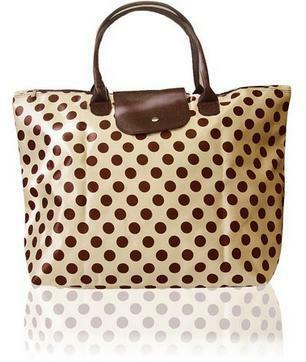 Versatile design polka dot tote that folds for an easier carrying option. The perfect large tote for the beach season! Features double-handles with zipper and fold-over snap closure.